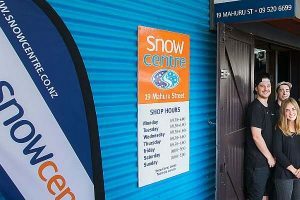 After relying on custom software to run its business for over two decades, iconic New Zealand winter sports retailer Snowentre opted for a complete overhaul by implementing n2 ERP from First Software. As a result of the project, Snowcentre has, in cthe words of managing director Neil Hunt, “Gone straight from the 1990s into 2018”, and is ready for a prosperous future which combines online and in-store sales with ease. Snowcentre got its start in 1982 as a small ski workshop in Parnell, Auckland. Originally known as Woody’s Ski and Surf, the store became Snowcentre when Hunt purchased it in 1993. It has since grown to become New Zealand’s leading ski and snowboard destination, stocking a huge range of mountain, freeride and freestyle equipment and accessories. Snowcentre also served as the inspiration for sister brand SUPcentre, which provides a complete range of stand-up paddle board products and accessories. SUPcentre, a smaller business, served as a test case for n2 ERP before Hunt decided to implement it at Snowcentre. Functionality required included point-of-sale, ‘on-behalf’ sales of second-hand equipment, workshop, rentals and stock management. It was akin to trying to build a detailed Lego model with Duplo blocks instead of the smaller sized ones; the fit was poor and necessary modifications were either not possible or excessively costly. The company, says Hunt, just had to trust First Software. But the SUPcentre precedent provided good reason for having faith. The biggest difference to Snowcentre’s business since introducing n2 ERP can be seen in a very simple, yet highly satisfying metric. “We’ve had one of our best seasons ever. We’ve seen huge growth in people coming through our store,” Hunt confirms. While it had not previously sold a lot through its online presence, a professional website which is now integrated with its in-store presence, and which provides for ready integration with social media platforms, is credited with driving in-store sales. “You get the whole lot from n2: your website, the POS, stock control. And the website looks professional with all the bells and whistles. In a stroke, it’s brought us years ahead – and when customers go online and see an exciting site, they come instore to buy,” he adds. All stock is now ‘front-loaded’, with data entered only once to appear as inventory for online, in-store and Trade Me listings; n2 ensures a ‘single source of the truth’. “Loading once, rather than rekeying, is important because most of the stock we carry are once-off items with unique SKUs,” says Hunt.